Every summer I travel with a few friends to spend a long weekend in the Eastern Sierra. Once or twice before I’ve made a detour on the way back home to visit the Sierra Foothills wine country, and this year I decided to do it again. I’d made plans for a couple of stops in El Dorado County on the Tuesday following the Eastern Sierra trip, but figured that I’d also have some time on Monday afternoon. It seemed like a good opportunity to check in on Matthew Rorick of Forlorn Hope Wines to see his vineyard outside the Calaveras County town of Murphys, and the timing worked out for him as well. That Monday was a beautiful day to drive across the Sierra, first heading over Monitor Pass and then Ebbetts Pass – both among the higher Sierra road crossings – along Highway 4. The highway leads right into Murphys, where I turned onto a road that became increasingly narrow and winding as it led me north from the town. After passing well-known Mercer Caverns and negotiating a couple of hairpin turns, the road dropped down toward San Domingo Creek. A side road crossed the creek and I soon spotted the winery and parked across the road from it. Forlorn Hope 2015 Riesling, Kick-On Ranch, Santa Barbara County (barrel sample). Light color, with citrus and orangepeel aromas plus touches of flowers, petrol, and spice. Medium-light weight with a lively mouthfeel and finish. Forlorn Hope 2015 Gemischter Satz, Mokelumne Glen Vineyard, Lodi (barrel sample). Light color, with intense aromatics of stone fruit, flowers, and fresh herbs. Bright acidity on the palate with a bit more weight than the Riesling. Very distinctive! Forlorn Hope 2015 Verdelho, “Que Saudade,” California (barrel sample). Fairly light color, this featured more upfront floral aromas than the first two wines along with citrus and lemonpeel notes. Moderately rich mouthfeel with a bright, lively finish. Forlorn Hope 2015 “Nodosaur,” Rorick Vineyard, Calaveras County (barrel sample). Light color, showing apple and pear fruit along with touches of flowers and wet stone on the nose and a light hint of perfumey Muscat. Medium-bodied with a firm, chalky texture and finish – this seems like it may need more time to develop than the first three wines. Forlorn Hope 2015 Gewürztraminer, “The Faufreluches,” Hill Family Vineyard, Russian River Valley (barrel sample). Skin-fermented. Light orange color, with apricot, orangepeel, floral, and citrus aromas plus an intriguing hoppy note. More weight in the mouth than most Gewürz, with some distinct grip on the finish – fascinating wine that’s extremely distinctive. Forlorn Hope 2015 Albariño, Rorick Vineyard, Calaveras County (barrel sample). Fermented and kept on the skins for six months. Slightly cloudy light orange-bronze color, with less fruit on the nose and more phenolic character, along with spice and stony mineral notes. Chalky texture with a moderately grippy finish – intense orange wine character and not your typical Albariño! Forlorn Hope 2015 Chenin Blanc, Rorick Vineyard, Calaveras County (pre-release). Lighter color, with some higher-toned bruised apple aromas along with touches of citrus and herbs. Bright yet round mouthfeel, with vibrant acidity on the finish. A little awkward at this stage, shortly after bottling, this should show better given some time in bottle. Forlorn Hope 2015 Sangiovese, “Sogni della Speccia,” Suisun Valley (barrel sample). Medium-light purple, this displayed great aromatics of black cherry, spice, and earth, with a hint of wet stones. Medium-bodied with a firmly tannic finish – this has the potential to be a real standout. Forlorn Hope 2015 Barbera, Rorick Vineyard, Calaveras County (barrel sample). Medium-light purple, featuring red cherry, earth, and herbs on the nose. Medium weight with juicy acidity and fairly big tannins – more time in barrel should help to round this one out a bit. Forlorn Hope 2015 Trousseau Noir, Rorick Vineyard, Calaveras County. Very light ruby color, showing some herbal, stemmy notes upfront along with flowers and spice, with apple and cranberry fruit in support. Medium-light bodied and a moderately grippy finish – an intriguing take on Trousseau. It was well above 90 degrees by the time I arrived at Rorick Vineyard / Forlorn Hope Wines early in the afternoon, so I wasted little time in finding the entry to the winery and stepping into the cooler space there. I soon located Matthew and he welcomed me in. He had already told me that he and his crew would be pressing their first fruit of the season, Verdelho from Bokisch’s Vista Luna Vineyard in Lodi. Sure enough, a press cycle was underway, but as there wouldn’t be much to do until the cycle was finished, he thought it would be a good time to give me a quick tour of the vineyard. A little background information is in order here. I first met Matthew back in 2009 at the annual TAPAS (Tempranillo Advocates, Producers, and Amigos Society) wine tasting event, where he was pouring his wines made from Iberian grape varieties. I soon learned that he made a number of other wines that sounded quite interesting. The winery name of Forlorn Hope comes from the Dutch “verloren hoop” (lost troop) – the name given to the group of soldiers who led the charge into the heart of the enemy defense. The odds were always heavily against them, but those who were fortunate enough to return from the attack were assured promotions and glory. The wines that Matthew makes can be seen in a similar light. It must sometimes seem that he’s fighting an uphill battle as he works with some of California’s more obscure grape varieties, most of them sourced from lesser-known wine regions of the state – his site in Calaveras County certainly counts as one of those. Matthew studied at UC Davis, where he earned a degree in Viticulture and Enology in 1999. Over the years, he’s worked for a number of California wineries, including Dashe, Peter Michael, Chasseur, Miura, and Elizabeth Spencer as well as working on wine projects in New Zealand, South Africa, and Chile. Matthew launched Forlorn Hope in 2005 with a Petit Verdot, Petite Sirah, Syrah, and Tempranillo. His experiences have shaped his current practices, which are best described as non-interventionist. Matthew’s effort to reflect his vineyard sites means that some common additions (cultured yeast, water, acid, enzymes, etc.) are not part of his winemaking regimen. Depending on the variety, vineyard, and vintage, he may press white grapes right away (or with a short cold soak) or ferment on the skins, and with reds he may use varying percentages of whole clusters in the fermentations. None of the Forlorn Hope wines are aged in new oak. While Matthew typically will add sulfur to the wines, he’s produced bottlings with no added sulfur on occasion too. I’d visited Matthew in late 2013 at the Tenbrink Vineyards facility in Fairfield where he was then making his wines, and heard about his new vineyard in Calaveras County. 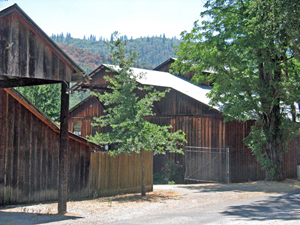 He and several other family members purchased the historic Stevenot winery and adjacent vineyard property in summer of 2013 (the Stevenot label itself has been owned separately from the winery and vineyard property since 2010 and was not part of Matthew’s deal). When I’d talked with Matthew that day, one of the things he told me was that part of his new vineyard was situated over limestone. I had not known of limestone soil in the Sierra Foothills and hadn’t thought much about his mention of it since then. But driving past Mercer Caverns on my way to the vineyard that day, it dawned on me…limestone…caverns – of course! Where do large caves often form? In porous limestone rock – I should have made the connection earlier! I followed Matthew back outside the winery and into the heat of the afternoon. He told me that some original structures at the site date to the 1800s while others, including the building housing the current winemaking facility, were built more recently but in a similar style. The winery and surrounding vineyard are in a stunning location, a beautiful valley surrounded by forested hills. Out in a somewhat remote spot, there’s plenty of wildlife around, including bears, wild boars, foxes, bobcats, mountain lions, and golden eagles. The site had been a vineyard as early as the 1850s though those early vines are long-gone. Matthew pointed out the block of own-rooted Old Wente clone Chardonnay vines planted in 1974 by Barden Stevenot, who established his namesake winery in 1978, one of Calaveras County’s earliest commercial wine ventures after Prohibition. 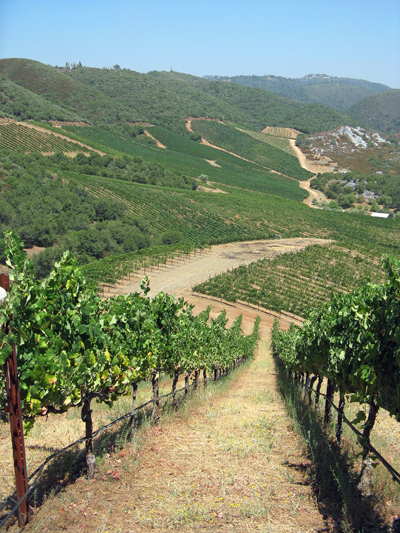 Barden expanded his original vineyards in the late 1990s with his purchase of the adjacent Dragone Ranch property on the slopes above San Domingo Creek. Matthew said that much of that land had been cleared not long before Barden’s purchase as a firebreak to help stop a large wildfire in the area, making it easier to turn it into a vineyard. Barden sold the property in 2006, by which time he had added many grape varieties to his expanded vineyards – there were nearly 20 varieties on the property when Matthew purchased it. As we started our way up the vineyard slopes in Matthew’s truck, he told me that there are over 70 acres planted. After he acquired the property, he put in a test block near the Chardonnay vines to see what other varieties might do well there. The test block includes eight red varieties and 14 whites – Matthew mentioned that the Mondeuse there showed particular promise and that’s one variety he has added to the vineyard. Varieties that were already on the site when Matthew and his family members purchased it included the Chardonnay (both Wente and Dijon clone), a number of Rhône and Iberian varieties, plus others such as Barbera, Cabernet Sauvignon, Merlot, and Zinfandel – a total of 14. He has now added more varieties, including Chenin Blanc, Vermentino, Trousseau, and Mondeuse, and the vineyard is now up to 20 grape varieties. Matthew drove us up the steep hill to point out a spot that showed the vineyard soil nicely. 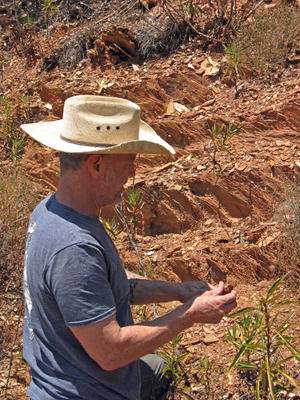 He pulled out a chunk of the schist topsoil on the hillside and demonstrated how easily pieces flaked off of it. There’s decomposed granite and clay below the schist in some parts of the vineyard, and limestone below it in other spots. Matthew – who had previously worked with Sierra Foothills fruit for a number of years – said that this unusual combination of soil types, in combination with the site’s elevation, was a key reason for wanting to buy this particular property. We talked a little about the limestone subsoil, and Matthew noted that a vein of it runs through parts of the Sierra Foothills, mainly in Calaveras (notably, there are a number of other large caves in the area in addition to Mercer Caverns) but also in Tuolumne County. He pointed out a stand of buckeye trees directly above Mercer Caverns on the opposite slope across the creek – the buckeyes are a noticeably different color from the other trees. Matthew told me that many trees will not grow well on limestone soil but buckeyes will, so a concentration of these trees can be a good clue for finding limestone soil. He also pointed out his irrigation pond in a small natural bowl below us – he said that the unlined pond never fills due to the porous limestone along one side of it. At the top of the vineyard rows, we looked at the Tempranillo vines there – always an early-ripening red variety, the large clusters were already finishing up veraison. Matthew noted that one feature of his vineyard site is that it’s not uncommon to see a 30-40 degree diurnal temperature swing, so it generally cools down considerably in the evening. One issue he’s noted with this wide variation is that condensation can cause more mildew pressure than he expected to find in the typically dry summer climate of the area. Another issue he’s battled is frost in the lower parts of the vineyard. Matthew said that frost can be a problem every year, and although he has sprinklers for frost protection, they’re dependent on enough water from the adjacent creek to run them – not always possible in these recent drought years in California. After hopping back into Matthew’s truck, he drove us up to the highest point on the west side of his vineyard, where he has Albariño vines – he said that this is typically the first variety picked. As we started on our way back to the winery, Matthew said that about 70-80% of his Forlorn Hope wines are now made from estate fruit, though he still buys fruit from other sources, including Sémillon from Napa Valley, various German varieties from Mokelumne Glen Vineyard in Lodi, etc. Matthew thought that harvest would probably be around two weeks later than last year’s very early harvest, but he still expected to have a lot of his fruit in by Labor Day. Back at the winery, we found there was still a little time left until the Verdelho press cycle was finished so Matthew – who hadn’t had time yet for lunch – made himself a sandwich. Even though I’d already had lunch along the way from the Eastern Sierra that day, I have to say that sandwich sure looked good! 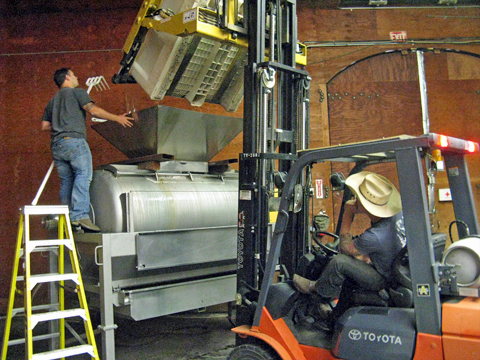 He checked the stainless steel tank that the newly-pressed Verdelho was being pumped into, and before long it was time for Matthew and his assistants Chris and Terah to unload the press and then load more fruit into it. Some of the bins of Verdelho fruit going into the press had undergone partial foot-treading and some not – there was about 6-7 hours of skin contact in those bins prior to pressing. Matthew said that the Verdelho will be fermented in an open-top tank and then racked into neutral oak for aging. Once the new press cycle had begun, Matthew grabbed wineglasses for all of us and started pulling barrel samples of 2015 Forlorn Hope wines – plus a couple of bottled wines – for us to taste. Most of the wines were whites, and Matthew said that he typically lets all of them (except the Sémillon) go completely through malolactic fermentation. As they generally have a low pH, there’s still plenty of acidity afterwards. We started with Riesling from Kick-On Ranch in the Los Alamos Valley region of Santa Barbara County. Still on its primary lees (Matthew mentioned that he’s keeping whites on the lees for longer than he used to), this is being aged in a neutral 400-liter puncheon. It will probably stay in barrel for another year, as Matthew has found this wine takes its time to develop, with the 2013 vintage only now starting to come into its own. Next was a sample of what may be Forlorn Hope’s most unique bottling, the Gemischter Satz (“mixed set” in German). This is a field blend made from 38 German and Austrian grape varieties planted at Lodi’s Mokelumne Glen Vineyard, all picked and pressed together. Like the Riesling, it’s still on its primary lees, and it was among the most distinctive among a whole group of distinctive Forlorn Hope wines that I tasted. We moved on to the “Que Saudade” Verdelho, sourced about equally from Vista Luna Vineyard in Lodi, DeWitt Vineyard in Amador County, and Rorick Vineyard. Fermented in an open top tank and racked after primary fermentation to larger oak, this was racked again after six months. Matthew said he will probably keep this in barrel longer than he has with earlier vintages – perhaps as much as another year in barrel and one in bottle prior to release – as this wine picks up more weight and complexity with time. The next wine was the “Nodosaur” blend from Rorick Vineyard, composed of around 80% Picpoul and Albariño, plus about 17% Verdelho and 2-3% Muscat. The different varieties were added to the same fermenter at different times, except for the Muscat which was blended in later. Our next wine was sourced from Hill Family Vineyard in Russian River Valley – a skin-fermented Gewürztraminer called “The Faufreluches.” Light orange in color with exotic aromatics, this was quite unlike a typical Gewürztraminer, and I thought Chris nailed the description when he said it reminded him a bit of a hoppy IPA. 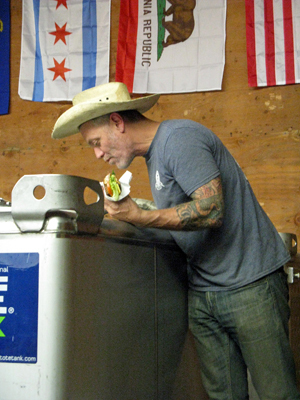 The final white barrel sample was Albariño from Rorick Vineyard, kept on the skins for six months in an egg-shaped polyethylene Flextank fermenter. Another atypical take on an aromatic white grape variety, Matthew said he’s planning to age this for up to two years in a neutral barrique, and perhaps to allow the wine to oxidize a bit. We did taste one more white, this one a recently-bottled but not-yet-released 2015 Chenin Blanc from Rorick Vineyard, from fruit grown on a steep portion of the site with limestone soil. As I was starting to run a little short on time before I had to take off, we just tried two red barrel samples, starting with the “Sogni della Speccia” Sangiovese from a vineyard planted on shale soil in Solano County’s Suisun Valley. Matthew said that the vineyard has changed hands several times in the years he’s been working with the fruit, and that the 2015 would be his last vintage from there. This wine will probably remain in barrel for another year or more. We then tried Barbera from Rorick Vineyard – the fruit was from both the upper and lower parts of vineyard, with two different pick times. Matthew has not added any sulfur to the wine to date, and he plans to bottle both a no-sulfur and a sulfured version. We finished up the tasting with one more bottled wine, the recently-released 2015 Rorick Vineyard Trousseau Noir. This was fermented entirely with whole clusters, spending about 20 days total on the skins, then aged for six months in a neutral puncheon. This was the lightest-color Trousseau I’ve seen (it could have easily passed for a rosé) and showed the variety’s surprising tannins on the finish – another interesting take on a grape gaining more attention in California these days. During our tasting – I believe it was while we were on the “Nodosaur” blend that’s meant to highlight the qualities of Rorick Vineyard – Matthew offered this as the defining character of his wines from his site: “aromatics and grip.” I think those attributes are present in most of the Forlorn Hope wines but I’d agree that those from his own vineyard seem to display them even more. And yes, even the whites – many of which have at least some skin contact prior to pressing – show more grip than you might expect. 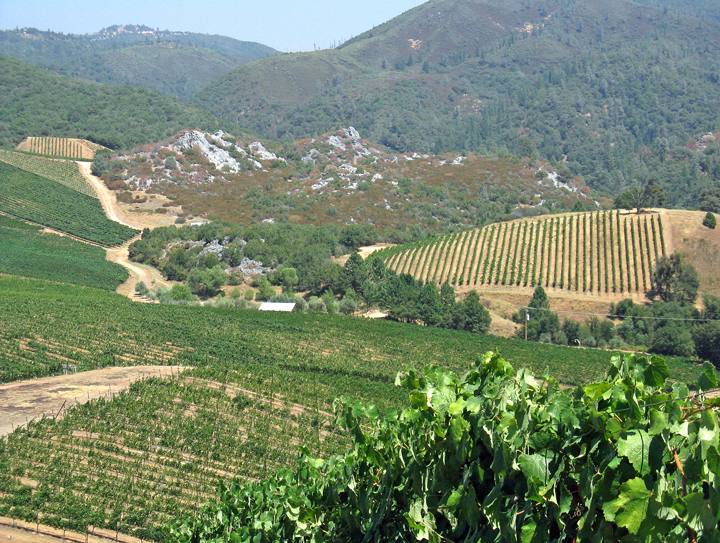 Matthew continues to make some of California’s most interesting and distinctive wines, working with many grape varieties that are unusual to downright rare in the state. Working with these less-common grape varieties – and making a number of his wines in non-mainstream ways – presents challenges as well as opportunities, helping to set the Forlorn Hope wines apart from the crowd in a competitive market. Nearly all of his bottlings are small-production and tend to sell out quickly, but the Forlorn Hope wines remain reasonably-priced. With his new Calaveras County vineyard, Matthew has taken on a new challenge, but it was apparent during my visit how much he enjoys what he’s doing. He’s always been one of the more fun winemakers to talk with, and his sometimes-offbeat character provides a clue to how he works. While he’s not out on the far edge of winemaking methods, he seems to tweak his approach with something different and adventurous nearly every year. The Forlorn Hope wines are never less than thought-provoking, and at their best they can be revelatory takes on grape varieties both unusual and familiar.